The beauty that mother nature bestows upon is a gift. Many people feel this way and that is why we need to protect our lands and the environments that flourish there. Jill Haley is one of those people that appreciates and celebrates her surroundings wherever she is. 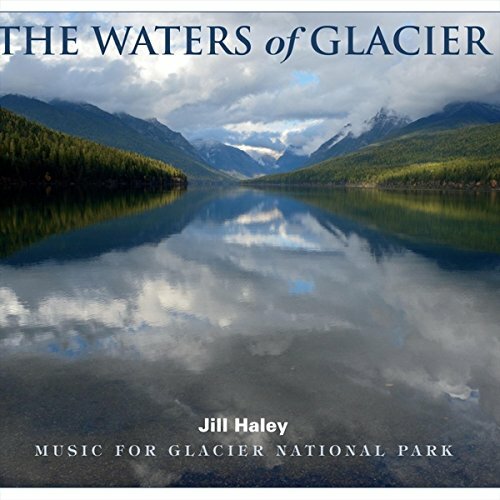 On The Waters of Glacier is her twelve track specifically for Glacier National Park. The area served as great inspiration. Glacier National Park is located in the U.S. state of Montana, on the Canada–United States border with the Canadian provinces of Alberta and British Columbia. The park encompasses over 1 million acres and includes parts of two mountain ranges, over 130 named lakes, more than 1,000 different species of plants, and hundreds of species of animals. This incredible pristine land is one of our wonders of nature that is protected and revered. The Waters of Glacier was brought about by one simple choice. Jill was looking out the window of her residency there at the park and it was raining. Rather than complain and fall into self-pity she decided to enjoy the blessing of water. This was the beginning of creating some very beautiful music fit for such a grand location. The great outdoors can inspire many things but when you are a multi-faceted artist like Jill, it is literally music to her ears. And now that inspiration and vision are documented on CD with a booklet and some great pictures of the area of the park. Jill Haley plays the oboe, English horn, piano, and handbells on the album and she is accompanied by David Cullen (guitar), Dana Cullen (horn), Tom Eaton (electric guitar, keyboards, and bass) and the incomparable Michael Manring and his distinct bass playing. The Waters of Glacier continues a string of recordings dedicated to the environment. I have always enjoyed her offerings not only for the superb music but for the subject matter. Nothing is more precious than our planet, the giver of life. To see all pictures gathered inside the CD for this recording and the music telling each story, well, it was like I took the trip myself. The music is so engaging and picturesque and certainly, that is the intent here. I think Jill really did a great job putting this project together and making an impact on listeners in several different ways. It is emotional because of our ties to humans and the earth and the serenity found within the mountains of Montana and subsequently in the music. The music is alive and as it flows through each track, the feeling of your own personal connection to nature clicks instantly on the very first track then intensifies with each succeeding track. The Waters of Glacier is a gorgeous representation of new age instrumental music with a divine purpose in mind. It is twofold, the first being the music to calm your soul and focus, and the second the moving sounds and atmospheres that reinforce the importance of national parks and the pristine nature that we can still find. In a world that is polluted and misused frequently, this is a wakeup call to reality. And first and foremost, it is a reminder of where we came from and what our job is as the stewards of this gift of life and beauty that is all around us.. Thank you for the reminder and the wonderful music again Jill.